I. A Bachelor’s degree with Physical Education as an elective from a University recognized by UGC with at least 50% marks. In case of SC/ST/BC the minimum marks shall be 45%. II.A Bachelor’s degree from a University recognized by UGC with at least 45% marks and 40% marks for SC/ST/BC/ candidates. Bachelor of Physical Education (B.P.Ed.) of at least one year duration (or its equivalent) from any institution recognized by NCTE. III.A Graduate in Physical Education. with 40% marks / B.P.Ed of three years duration..
Age: As per the existing State and Subordinate service rules. I.Intermediate (or its equivalent) recognized by the Board of Intermediate Education, Telangana with at least 50% of marks. In case of SC/ST/BC candidates, the minimum marks shall be 45%. II.Intermediate (or its equivalent) recognized by the Board of Intermediate Education, Telangana /A.P. III.Intermediate (or its equivalent) by the Board of Intermediate Education, Telangana/A.P with at least 45% as per NCTE Regulations, 2002 In case of SC/ST/BC candidates , the minimum marks shall be 40%. A certificate / Under Graduate Diploma / Diploma in Physical Education (or its equivalent) from an institution recognized by the NCTE. IV.A Bachelor’s degree with Physical Education as an elective from a University recognized by UGC with at least 50% marks. In case of SC/ST/BC candidates, the minimum marks shall be 45%. VI.A Graduate in Physical Education with 40% marks / B.P.ED of three years duration . 2. i) Diploma in Polytechnic in Woodwork/ Tailoring/ Bookbinding/ Embroidery / Fashion Technology / Garment Technology recognised by State Board of Technical Education & Training And ii) a Technical Teacher’s Certificate in lower/ higher grade in concerned trade issued by Director, Government Exams of AP/TS. 3. A 3-year Diploma course in Home Science recognised by State Board of Technical Education and training. Separate Screening Test for languages posts i.e., TGT, PGT posts (Telugu, Hindi, Urdu and Sanskrit) will be informed later. 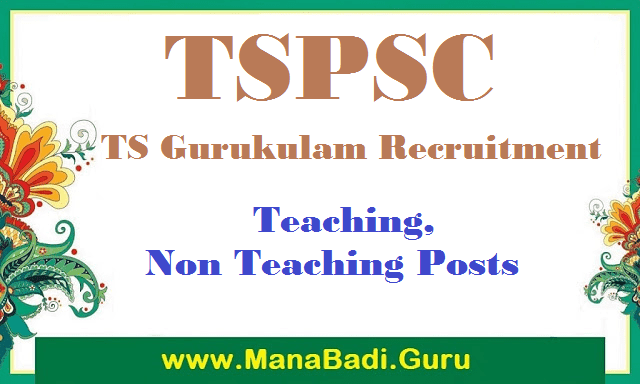 Tags:TSPSC Recruitment 2017 Notification,TSPSC Gurukulam Teaching, Non Teaching Recruitment 2017 Notification,TSPSC Gurukulam Phyasical Director, Physical Education Teacher and Craft Teacher Posts, TSPSC Gurukulam Revised Qualifications for Phyasical Director, Physical Education Teacher and Craft Teacher.